Nicole and Barry met at work 9 years ago, and after a great friendship, their emotions blossomed into love. After 4 and half years of dating they both agreed marriage was the next step. Nicole said, “He’s a shy guy, so the proposal was simple and sweet”. He proposed over morning pancakes, and he knew she was the one and that we would wait for as long as it took for the answer to become yes. When Nicole asked Barry what he imagined when he thought of a wedding dress, he said he imagined her surrounded by beautiful blue water. After some research, they found Destify’s planning tools and began working with their agent Brittany. Brittany helped the couple narrow down locations and resorts. The couple said, “My friends and family were so pleased with her help, she became part of the family”. 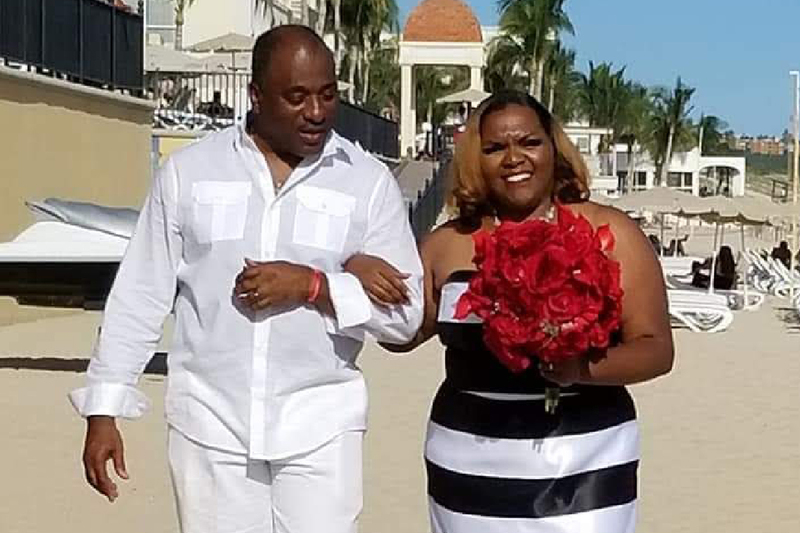 The couple chose Cabo San Lucas in Mexico as their destination and booked their wedding for the gorgeous RIU Santa Fe all-inclusive resort. The couple loved how everything was taken care of by the resort, from the professional wedding department, to all of the food and drinks included. On the day of the ceremony, Nicole’s sister did her hair and makeup while the resort provided champagne and mimosas to make the getting-ready process easy and relaxing. As Nicole walked down the aisle to the beach setup, beautiful music played in the background. After the ceremony, the couple took photos amongst the scenery while guests partook in a cocktail reception. Although every part was so memorable, when it came to her favorite part Nicole said, “I would say sharing my vows to my husband with God’s work as the backdrop”. The couple followed their ceremony with a dinner reception overlooking the ocean, where guests enjoyed a delicious meal and music. Nicole danced with her father, and her husband, and it was the wedding of her dreams. The couple both agreed that hosting an all-inclusive destination wedding is unbeatable. You get the best prices and you don’t have to plan anything yourself. They said the hotel and amenities were beyond what they could have imagined. You only marry your soulmate once, so make it magical!